Antarctica Whistleblower: Aliens have been in contact with Home Sapiens from the beginning - They have seeded us! Another previous team of engineers and scientists had dug out the top layer of one of octagon made of a pure black substance that was built on top of two more black octagonal structures that went down deep into the 2-milethick ice. The following testimony, which starts around the 11.20 mark in the video, is by one of those Navy Seals who was there, but now retired. He calls himself Spartan 1 and gave me permission to videotape him on July 19, 2018 - as long as he was in the shadow and his voice was altered. Linda Moulton Howe? You gotta be kidding me. She is a major believer in whatever UFO/alien bs comes down the pike. Definition of "gullible": Linda Moulton Howe! She doesn't have a questioning bone in her body. She is listening to hearsay without one iota of evidence. But it's right up her alley. First of all Edward Lopez, what "U.F.O./E.T." evidence is irrefutable...? Even Dr. Steven Greer's "mini mummy" D.N.A. sample came up inconclusive due to the FACT that there is nothing in the record to compare it to in order to say that it is of an extraterrestrial origin. The fact is that the D.N.A. results will only come out : No Match Found in such a case. And "witness testimony" well... we all know what you need in a court of law (hopefully,...maybe not you). How do you know if Linda Molten Howe believes everything... ? Have you heard everything that she has heard in her life and picked out the stories among them that she decided to share? Answer: No. I am tired of the personal attacks against people, especially based on even less evidence in the personal attacks claimed against the people being attacked. You should be ashamed Edward Lopez, bad form indeed. 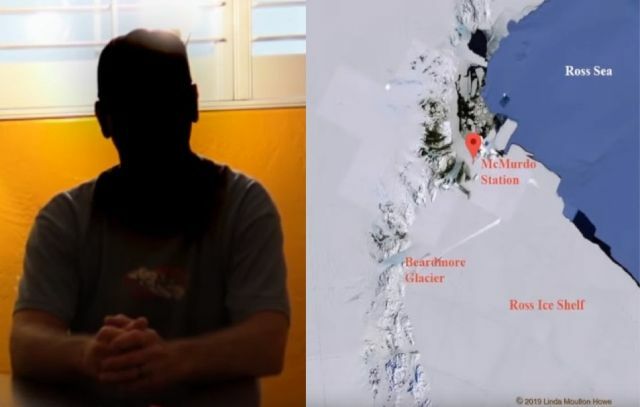 Actually Secret Interconnected bases exist,ive been in the Antarctic-South Pole Base Maintenance Application,ive seen structures,you cant see on google earth,because of censoring,ive seen underground bases dating back from WW2,ive seen things,for which there is no logical reasoning for there existence,i was sworn into non disclosure ,what you see simply doesnt exist,neither is it documented-UN officially.officially,i know "Alien Physics' A-2-Z-...if you knew what secrets there are in the south pole,nobody will believe they exist,so therefore this isnt public news,what is described in the video,i know the exact locations to which there are references made to etc.. If you take "Haswell Island" it features "fresh water Lakes" Natural Oil/Gas",it was also a "Fully functional WW2 3rd Reich Special Ops Sub Base",in addition,the base was named "Ice Palace/Citadel"..today Haswell Island is a protected Island its a forbidden zone,any person found there will be shot on sight,by numerous countries within a treaty of nations,close to haswell island..on both sides of a "Natural Sea-Way".are ex "German Naval 88mm Ack-Ack Gun Emplacements,during WW2,they were put there for a reason,to protect a hidden "Under Sea Ice Entrance",For which the "German Navy Established Secret Under Ice Bases" according to "Hiemlers Fortifications Specifications".they existed,as that was the reason for "Operation High jump" with admiral Byrd"..even today any person who enters certain forbidden zones,no fly zones will be shot on sight,the reference to the "Hole In the Ice" know exact co-ordinates for this camouflaged google earth,hole,you cant access that location,because it is a environmental protection zone,various countries are signatories,to a treaty,with 50 km radius..i know these things on a need to know basis.. The Reference of The Black Sun,if we can look at the "Eye Witness Account" of Christs crucifixion,the "Sun,turned black,we know that when we backtrack where planets were on that specific date,time,all the planets including earth,were in a perfect straight line,with the sun,therefore there was total darkness.the sun turned black,now with reference to the 8-Sided Octagonal" hieroglyphics" they refer to "Ancient Civilizations" from certain parts of the universe,like a "Ancient star Map/Chart"-The 8-sided Octagonal shape refers to where in the universe,various extra terrestrial intelligence originated from,the center of the 8-sided octagonal structure was a gathering location,for which these extra terrestrial intelligence would meet,the ancient space craft found close to these structures,is a clear indication,that these were explorers from the universe..what there objectives were is unknown,the 8-sided octagonal structure gets its power source from "Concentrated Magnetic Field Abnormalities" Only Present in the South/North Poles at certain locations,the inner structure conduits its energy,using gold,silver seams,which in basalt rock,is a natural "electrical conduit" so to speak"-gold,silver seams exist in basalt rock which traverse longitudinally-the advanced technology used realized that using the natural energy source from deep within the earths inner core they could harness it for whatever reason.. they wanted it,dim greenish,bluish glow is constant when electrical energy derived from magnetic field abnormalities is common when conducted through black basalt rock,to explain it in laymans terms you need to know the fundamentals of "alien Physics"